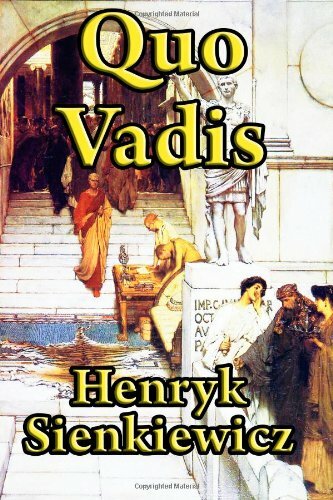 Amazon.com description: Product Description: Quo Vadis means where are you going? and is an allusion to the New Testament verse John 13:36: "Whither I go, thou canst not follow me now; but thou shalt follow me afterwards." Quo Vadis tells of a love that develops between a young Christian woman, Ligia and Marcus Vinicius, a Roman patrician. It takes place in the city of Rome under the rule of emperor Nero. Sienkiewicz studied the Roman Empire extensively and won the Nobel Prize for literature in 1905 for this book. This powerfull book has been translated into more than forty languages.